Spring has arrived in personam in this pretty etching by French book illustrator and engraver François-Antoine Aveline. He was born 1718 in Paris as the son of the engraver Antoine Aveline (1691-1743) and the grandson of Pierre Aveline the Elder (1654-1722). After the death of his father, he left Paris around 1750 for London. Here he worked for Wiliam Hogarth (1697-1764), creating satirical scenes like the Election print. He seemed to have changed his name to F. Aviline, perhaps to facilitate a proper pronouncation of his French name by his English speaking buyers. 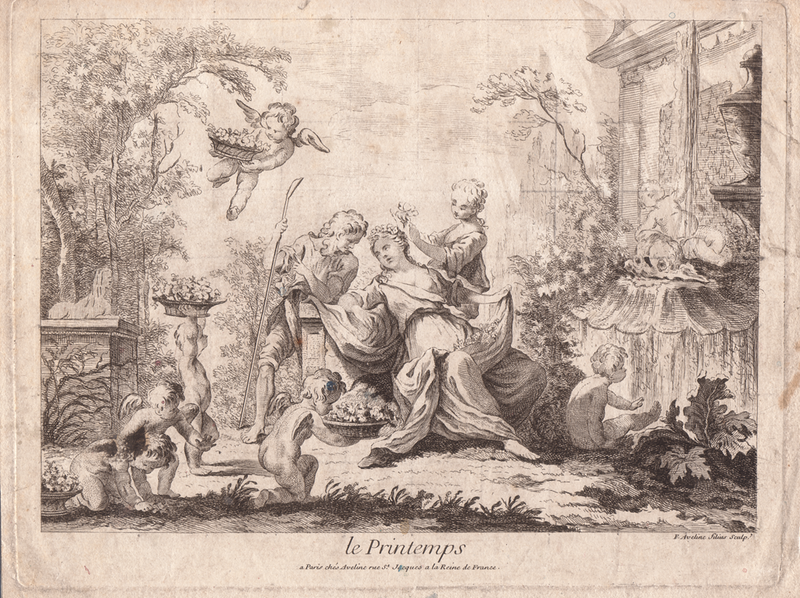 Le Printemps (Spring) presented here is the first in a series of four prints after designs by his father Pierre Aveline. The son consequently marked it with F. Aveline filius sculp. We know of a series of earlier prints by Pierre showing the same theme, then after designs by François Boucher. 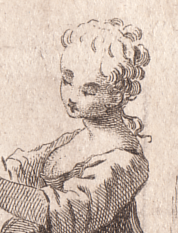 Nevertheless, this didn’t stop an unkown later artist to lay a fine grid on the etching to create a copy (perhaps a drawing) after the copy.